Usually it's the clouds that cast a shadow on the ground, not the other way around. Wednesday morning, Seattle area residents were treated to this spectacular sunrise as the first rays of light hit Mount Rainier before reaching the sky. 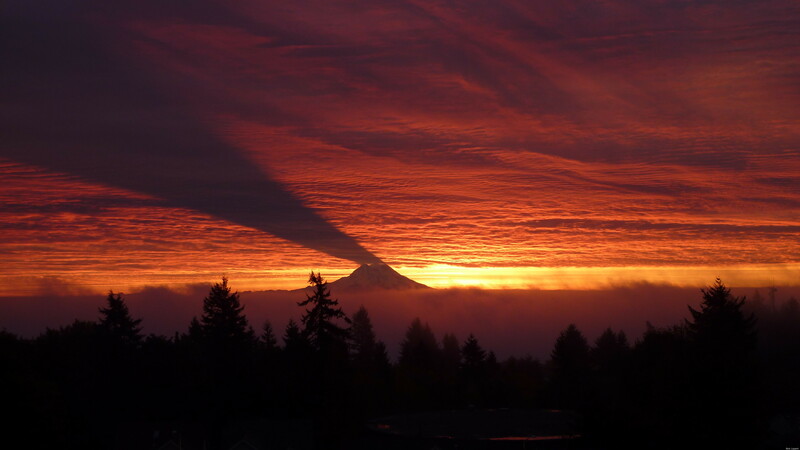 The cloud cover provided the perfect canvas for Rainier's shadow, making it almost seem like a smoking volcano. Conditions have to be just perfect for this sight to even occur. It only happens when the sun rises farther to the south as we head toward the winter solstice and has to be in the exact position to where Rainier blocks the first rays of morning light. A Discover Magazine blog adds, "Mt. Rainier is a volcano, climbing to a height of over 14,000 feet (4300 meters). There are no other mountains anywhere near that height nearby, so it’s really prominent in the landscape." You can see more spectacular user-submitted photos of the event from KOMO here. This shadow isn't the only stunning image taken of nature recently. Check of this photo of a double rainbow over London, and this NASA footage of Earth taken from 220 miles away.